I’m not jealous of many authors. I respect, admire, and enjoy many authors. There are even authors that I study, that I try to emulate, that I pore over in an attempt to better understand my craft. But jealousy? No. Jealousy is a bit different. In most cases when I enjoy an author, or a specific work, it’s enough just to be close to it. They inspire me…they convince me to keep writing when it seems as though I can’t find anything to say, or any interesting way in which to say it…they enrich me. Kurt Vonnegut, though…I’m jealous of Kurt Vonnegut. I think it’s because he wasn’t just great at what he did; he also did something that I simply cannot do. I know, because I’ve tried. And as anyone who has read anything I’ve ever written will know, I’ve failed. Here’s what he does that makes me jealous: he writes simply. He says so much with so little. He changes lives and defines characters with just a short sentence. Maybe less. And I can’t do that. Most of the authors I love can’t do that either. We’re long-winded creatures. We describe. We elaborate. We digress. We layer, we compound, we examine. Here’s the funny part: Vonnegut does all of that, too. He just does it more simply, and more efficiently. And I’m jealous of him. It’s jealousy because I want what he has, and try as I might (have once tried), I can’t have it. Writing isn’t easy, but I do believe that given enough time, enough practice, enough exposure to those who write well, once can achieve a certain level of competence. Maybe not talent, but the more you work at something, the better at it you will get. I’ve seen this happen. I’ve seen great authors discover themselves. I’ve seen amateurs find a voice. I’ve seen so many people with so much to say one day, at last, figure out how to say it. And almost none of them gravitate toward brevity. Not Vonnegut brevity, wherein a couple of words can suggest a complete narrative arc, wherein a chapter two sentences long provides a gut-punch from which the reader will never recover, wherein the author somehow, impossibly, comes to grips with a large comic conundrum explained with the vocabulary of a third grader. Vonnegut was a simple man who packed simple messages with disarming profundities. He looked like a cranky old grandpa and carried within him the wisdom of children. He was tormented by his experiences serving in World War II and was yet one of literature’s sweetest, most sincere humorists. He was a treasure, and I didn’t know what to make of him–and didn’t quite like him–until a professor suggested I read Mother Night. Once I did, I was better prepared for the man’s bibliography as a whole. 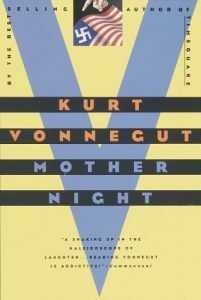 Mother Night is Vonnegut’s most traditional novel, most human novel, and probably his most relatable novel. It’s also his best, and it’s the one that I would without hesitation slot among the best books I’ve ever read. It’s the story of Howard W. Campbell, Jr., an American living in Germany at the onset of the second World War. He’s a playwright of some moderate success, married to a woman who is also his leading lady. And then he’s offered the chance to do some good, which is where everything goes wrong. He agrees, essentially, to work as a spy for the Americans. The Germans trust him, after all, and his experience lends him an air of authority when he’s hired to broadcast propaganda. The Nazis think they’ve lucked out having an actual celebrity reading their bulletins, and the Americans think they have a brave patriot behind enemy lines. The question of which side is correct the point of the entire novel. Campbell, sure, is working for the Americans. As he reads propaganda over the airwaves, he makes sure to sniffle, cough, clear his throat as instructed. These cues relay information that he never himself learns to the Allies listening at home. Then again, all the while, he is broadcasting actual Nazi propaganda. In the act of helping his country, he’s also perpetuating the horrors of Nazi Germany. The moment he realizes this–that work for the good guys was also work, perhaps even more effective work, for the villains–he knows there’s no going back to ignorance. His internal conflict…his struggle to live while encumbered by horrifying guilt…is the book. Mother Night is a meditation on who we are as people. On whether our words or our intentions mean more. On what defines us. On what we pretend to be, and what we wish we were. And it’s very funny. Vonnegut never could tell a story without giving it some kind of humorous twist, and to spoil the novel’s best jokes would be to rob you of your own discoveries. But I will say this: every single character in Mother Night, no matter how minor, lives at least a double life, and the subtle way in which Vonnegut weaves this detail through the fabric of his universe…potentially our universe…is tragic and comic in equal measure. Campbell is gradually torn apart by his inability to rectify his deeds with his intentions, and whether or not you ultimately find him guilty or acquit him will say something about you as a reader, and perhaps as a human being. More importantly, though, whichever side you come down on, Mother Night forces you to consider, deeply, the other. It’s exactly the kind of story that many authors would tell over the course of around 1,000 pages, with dense prose and horrific wartime vignettes sprinkled throughout. In other words, Vonnegut told it precisely the right way.